Black Cohosh is a perennial herb which is also known as black snakeroot, bugbane, macrotys, rattletop and rattleweed. Generally, fresh or dried root of Black Cohosh is used for medicinal purposes but the foliage is used as an insect repellent. It belongs to the buttercup plant family. Black Cohosh contains triterpene glycosides such as cimicifugoside and acetein, resins, caffeic acid, fukinolic acid, and isoferulic acid which makes it a great remedy for a variety of health issues. Due to its estrogenic activity, Black Cohosh has also been very popular with women facing menopausal and menstrual problems. Black Cohosh has been consumed by Native Americans for centuries to treat many health conditions. It is commonly used in the treatment of ailments related to women such as menopause, PMS, hot flashes, mood swings, vaginal dryness associated with menopause, menstrual abnormalities, and to induce labour and lactation. It is also often used to treat other minor to severe health issues such as sore throat, colds, hives, arthritis, constipation, backache, depression, and hypertension. Although it has traditionally been used as a folk remedy, many recent studies are now confirming the effectiveness of Black Cohosh in the treatment of these health conditions. Black Cohosh has a mild sedative activity that can help in the treatment of headaches caused by anxiety, stress and depression. Simply take one capsule or drink one cup of Black Cohosh tea before the onset of severe headache or migraine. According to researchers, a woman's body does not produce a balanced amount of progesterone and estrogen hormones during menopause. A few studies have now found that the estrogenic activity of Black Cohosh may reduce the symptoms of menopause by balancing the pituitary luteinizing hormones as well as progesterone production. A study conducted on 600 women in Germany has shown that 80% of the participants had reduced menopausal symptoms after using Black Cohosh remedy. Taking one tablet of Black Cohosh twice daily may work as Hormone Replacement Therapy for menopausal women. It may minimize hot flashes, mood swings, vaginal dryness, headache and depression associated with menopause. However, since Black Cohosh is regulated by the FDA only as a food and not as a drug, it is recommended to buy it from well reputed distributors and consult with your health care provider before taking it. Menstrual Cramps are caused by the contraction and inflammation of the uterine muscles. Black Cohosh is an anti-inflammatory and anti spasmodic herb. Therefore, drinking a cup of Black Cohosh tea can help in the treatment of menstrual cramps, PMS and other symptoms associated with it by reducing inflammation and severe contractions and spasms. It might be beneficial to start drinking Black Cohosh tea a day before the onset of the menstrual period and drink it once daily until the symptoms fade away. The anti-inflammatory, decongestant, astringent, anti-viral and anti-bacterial properties of Black Cohosh may help with respiratory tract infections, asthma, bronchitis, nasal congestion, colds and flu. Drinking a cup of Black Cohosh tea twice daily may help relieve the symptoms of such sinus and respiratory conditions. Black Cohosh has anti-rheumatic activity that may help relieve the pains and aches caused by rheumatoid arthritis. A simple remedy for arthritis is to take one capsule of Black Cohosh supplement or a cup of Black Cohosh tea twice daily. To make a cup of Black Cohosh tea, simply steeping one tea bag for five minutes into a boiling cup of water. Black Cohosh should only be used continuously for a short amount of time, since long-term continuous use can lead to liver damage. It is also common for Black Cohosh to interact with other herbs and medications. Therefore, for both of these reasons, it is highly recommended that Black Cohosh only be taken under the guidance of your doctor. Black Cohosh is not recommended for people who have hormone sensitive conditions, are going through chemotherapy or any hormonal treatment, are pregnant or breastfeeding, or taking oral contraceptives. 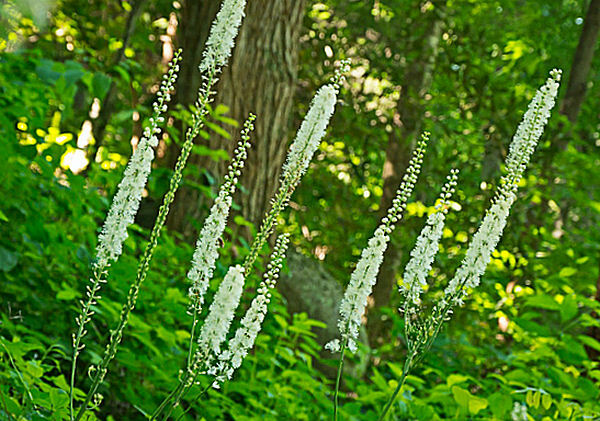 An overdose of Black Cohosh may cause nausea, vomiting, indigestion, headache, low blood pressure, and irregular perspiration. Black Cohosh is available at most herbal food stores in dried roots form, capsules, tablets, powder, and tincture. When buying dried Black Cohosh root make sure it is from a well reputed company. If fresh Black Cohosh plant is available, its roots can be pulled out in the fall when the plant has already brought the fruit. Simply cut the top part of the plant and wash the roots thoroughly. For easy storage the roots can be cut into small pieces. Pat dry the roots with clean absorbent cloth and let it sit on a rack in a ventilated area until the root is completely dry. It should be stored in an air tight jar. The leaves of the plant are not safe for pets, or human internal use. Therefore, they should either be discarded carefully or can be dried and saved away to make a salve for insect bites and inflamed or irritated skin.